PlumberInsurance.com of Stockbridge, Michigan, offers the best in commercial auto and health insurance. We are committed to exceeding your expectations. Commercial inland marine coverage covers tools and equipment you take onto jobsites when you are a contractor or plumber. This coverage protects your tools and equipment in cases of fire, theft, wind, collision, or other happenstance. These items are covered on your premises and on the jobsite. We offer commercial auto coverage for trucks, vans, utility trailers, and personal vehicles of the owner. As a business owner, you depend on your vehicles and want them to be well protected. Should an accident occur, you want to get your vehicle back on the job as soon as possible. Our carriers have excellent claim service that helps you do just that. We also cover liability you may have for employees who use their own vehicle while on the job. Your company can be sued for accidents caused by one of your employees driving their own vehicle. We can help make sure you are protected if you have employees using their vehicles while on the job. 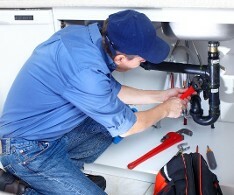 A plumbing contractor may be required to obtain a bond in order to take a job. We offer bid, performance, license, and permit bonds that may be required from various government entities. We offer several different group medical plans. We specialize in Blue Cross Blue Shield™ of Michigan and Blue Care™ network. We also have several other health insurance carriers, depending on your needs. We help you choose the best plan for your budget to attract and keep loyal employees. Excellent, easy-to-administer retirement plans are designed specifically for small businesses. These include simplified employee pension plans, or SEP, and simple retirement plans. Contact us in Stockbridge, Michigan, to request a quote for complete commercial auto and health insurance.